A circular double-storey with an interesting past, The Water Tower sits in a pleasant garden in the heart of Nieu Bethesda. 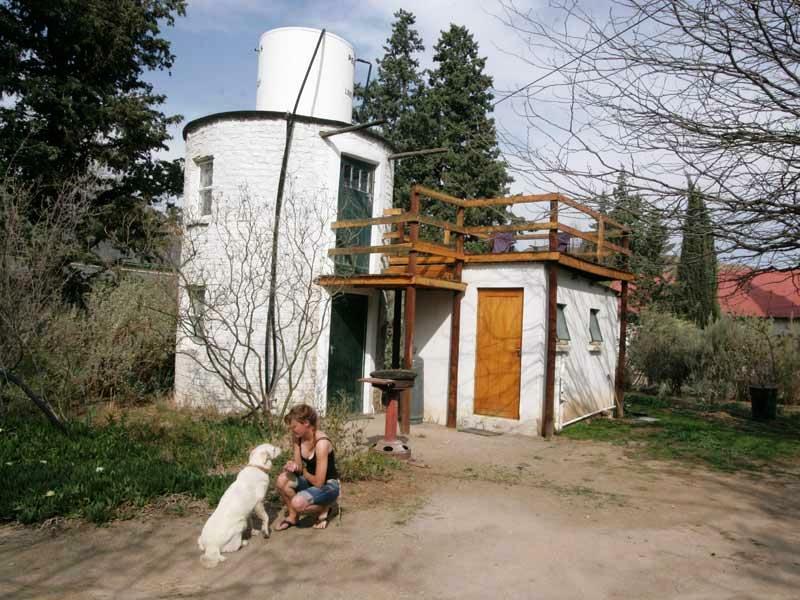 This quirky building was first a water tower and then a Buddhist meditation room. With whitewashed walls and wooden floors, it is a calm and clean space from which to enjoy the famous Karoo sky, day or night.<br /><br />The Water Tower sleeps two guests on a queen-size bed in the room upstairs adjoining the sun/star deck. The kitchenette is below with the private shower and composting toilet attached. Do some stargazing on the deck before creeping under your crisp cotton sheets, lambs wool duvets and mohair blanket. Pets are welcome by arrangement.<br /><br />Life in Nieu Bethesda potters along much as it did 130 years ago, when the village was founded. Stone water furrows still line the wide, dusty streets. Night skycaps are unpolluted by streetlights and the air is still fresh and clean.<br /><br />Nieu Bethesda has a working network of furrows, with water supplied daily from a spring on the plateau above the village. Residents channel water into their gardens using smaller gated funnels. Visitors can hike along the furrows up to the spring. Horse riding is offered at several places in the village as well.<br /><br />The area around Nieu Bethesda is good for either a leisurely ride or a challenging ride for serious mountain bikers. If youre feeling lazy, hire a bike from the Outsiders B&B and cruise around the village. Alternatively, wake up early to conquer one of the two mountain bike trails in the area. "I stayed at the Outsiders House. Dog friendly, an arty feel which is rare because all the furnishings are unique and well displayed. Great taste overall. High quality bedding which is not mass produced and has an individual touch. Clean and quite. Will definitely stay there again. Thanks. A lot to do in the small hidden gem of a town." "We had a wonderful time in Nieu Bethesda but the composting toilet is not for the fainthearted. We were given the option of another cottage but wanted to stay in the tower. It has a certain magic to it and actually really comfortable. Really cheap coffee....no chicory! At least have decent coffee! We shall not return to the Tower but certainly to Nieu Bethesda"
"The accommodation was very neat and clean. Perfect for an overnight stay. The Karoo Lamb food was also delicously hearthy for the cold.We will most definitely stop there again." "I only spent one night at the Water Tower and it was way too short. The place was clean and comfortable with all amenities for self catering available. Comfy bed and clean linen! Only negative was that the hot water didn&apos;t work properly so showering wasn&apos;t pleasant. Bedroom could do with a mosquito net for the summer time. But all in all - a thoroughly enjoyable and comfy place to stay. Highly recommended!" "It is very cute and we enjoyed our stay. I would just have liked to be warned about the toilet." "Very comfortable and well equipped. We had a fantastic time. Lovely garden for the dogs."